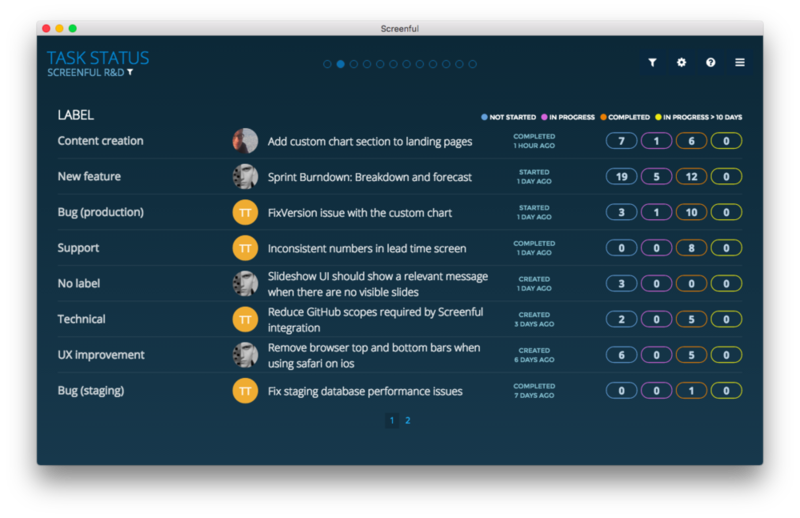 Screenful Metrics for GitHub is a dashboard for GitHub issues that helps you to stay on track with your projects. This add-on brings you visual dashboards and automated reports that you can share with your team. Use with any of your devices or rotate on the office TV. IS YOUR PROJECT ON TIME? Didn’t find the information you were looking for? Looking for that specific piece of information that is not captured by the any of the default charts? It's time to dig deeper into your data by creating a custom chart. Have those stakeholders that want to see the status of their issues, but don’t want to log in to GitHub? Subscribe them to the weekly digest so you can keep them on the loop without distracting your team. GET automated STATUS REPORTS to your email and to Slack! TV mode is a special mode of UI that is optimised for viewing content in an big screen such as in an office TV. Selected screens will rotate automatically at pre-defined interval. Great for sharing the project status with external stakeholders! "Screenful was best in every category. It beautifully and simply highlights key agile metrics for our whole in-office team and any visiting stakeholders"
Jaxon Klein, Co-founder, CEO at Keyo Inc.
"Using visual boards without metrics misses the whole point of improving performance. 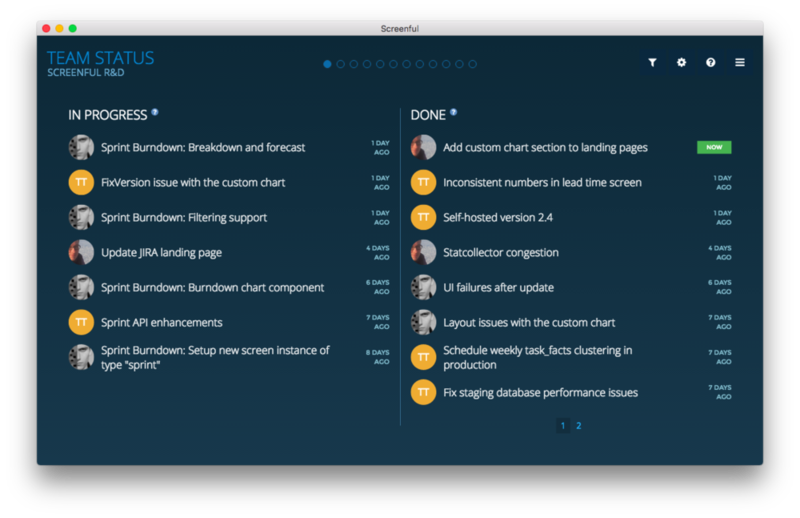 Screenful is a must have tool for my personal Kanban"
"Screenful allows me to easily identify where I am spending time so that I can ensure I'm working on the right things. The weekly email is a great summary delivered right to my phone"
"Screenful is a wonderful visualization tool that I use to illustrate to organizations why they should relentlessly focus on reducing lead time & cycle time, understand cumulative flow and decompose work"
How is the lead/reaction/cycle time calculated? Reaction time stops when the issue is assigned to a person. At the same time cycle time is started. Cycle time is stopped when the issue is closed or the pull request merged. Lead time = reaction time + cycle time. Are weekends included in the cycle time calculation? At the moment weekends are always included in the cycle time, as are non-business hours. Can I track pull requests? Yes. By default we include both issues and pull requests in the metrics but you can use the filtering feature to exclude one of them. How is Not started / In progress / Done defined? When you create a dashboard, you have the ability to adjust the mapping. Do you support columns in GitHub projects board? Unfortunately the GitHub API doesn't provide enough information for us to do that. We hope that API will be updated soon so we can add support for GitHub projects, too. How does the milestone burnup chart work? The milestone burnup chart takes all the issues that are assigned to the selected milestone, and assumes that to be your backlog. Then it checks your team's velocity and calculates a forecast date when your backlog should be empty if no new tasks are added. Follow these steps to set up the milestone burnup chart, or learn more from the Milestone Burnup FAQ. Why do you require read & write access to repos, wouldn't read access be enough? Yes it would as we only read data. Unfortunately the current GitHub permission system not very flexible for third party apps. We hope this limitation will be addressed in the future versions of the GitHub API. I'm using ZenHub/Waffle/HuBoard, can I still use Screenful? Yes, as long as your extension keeps the issue data within GitHub, you'll get a nice dashboard. However, since we pull the data via the GitHub API, you won't see the data that is stored outside GitHub. Screenful will not make changes to your data, it only reads it via the GitHub API. Can I consolidate data from multiple repositories into one screenful dashboard? Yes, you can add more repositories in the dashboard settings. Learn how to track multiple repositories from the Getting Started guide. How do I view these screens in my mobile/tablet? Input https://app.screenful.com into your phone browser, and once the page is loaded, save the page as a shortcut icon into your home screen by selecting "Add to home screen". Next time you can launch it quickly by tapping the icon. Do you provide desktop clients? We have native desktop clients available for Windows and Mac. How do I set this up on a big screen? Read the online guide about the TV mode and tips for setting up the hardware from our blog. Can I mix Screenful dashboards with content of my own when running in TV mode? Yes, there are 3rd party apps that allow you to schedule and organise different kind of content to your screens. These range from simple browser plugins to digital signage solutions such as ScreenCloud or truDigital. Can I embed some of these charts into my intranet? You can embed any individual screen into an iFrame. Learn how to construct an embeddable URL from our online guide. Why is the number of repositories limited to 10? Importing multiple repositories from GitHub API can be slow and therefore some limit is needed to keep the loading times reasonable. Just let us know if you need more repositories. How often data is updated on my screens? The Getting Started Guide contains Instructions for setting up your dashboard. See also our Accounts & Pricing FAQ.